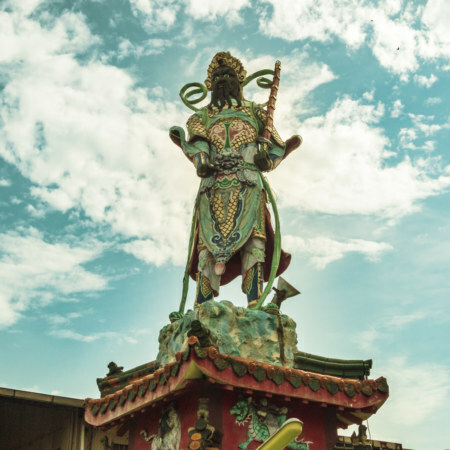 The gigantic statue of Xuan Wu, the Dark Warrior, on top of Hengwen Temple in Yuanlin. 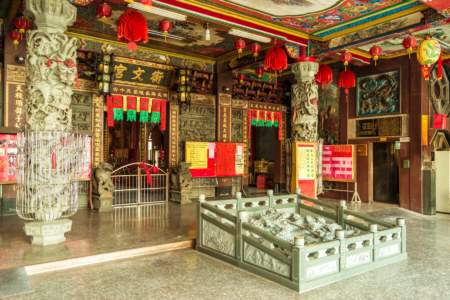 Héngwén Temple 衡文宮 is located on the south side of Yuánlín 員林, a mid-sized city in Changhua 彰化, Taiwan. 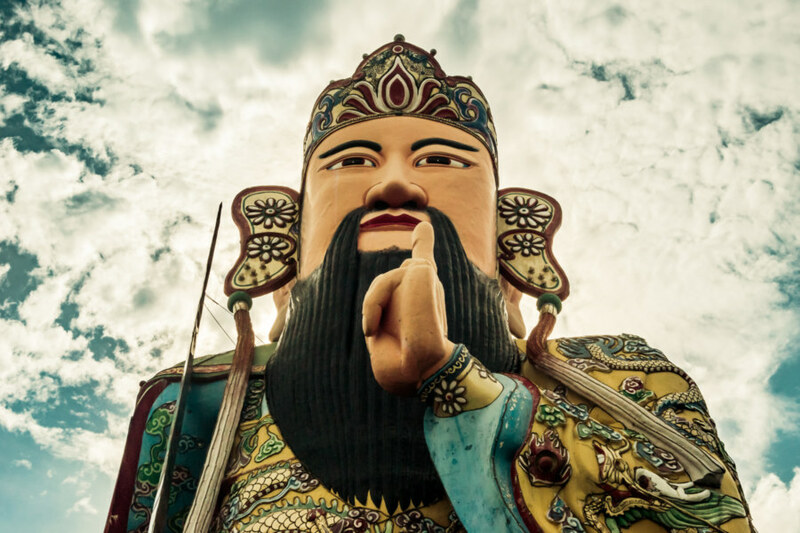 Completed in 1976, this temple is mainly notable for its 72 foot-tall statue of Xuán Wǔ 玄武, literally “Dark Warrior”, alternately known as Xuán Dì 玄帝 (“Dark Deity”) or Xuántiān Shàngdì 玄天上帝 (“Dark Heavenly Deity”) among many other names. 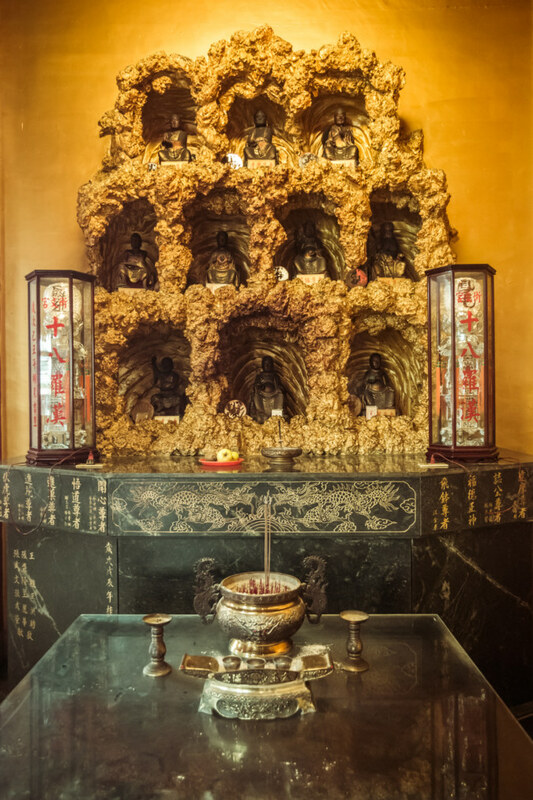 The statue itself is a hollow structure containing several additional floors filled with murals depicting the origins of Xuan Wu as well as various small shrines. 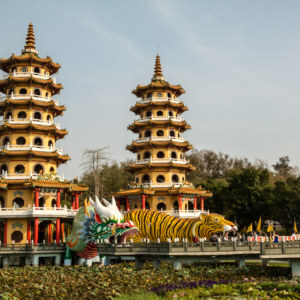 A similarly oversized statue of Xuan Wu can be seen on the famous Lotus Pond 蓮池潭 in Zuǒyíng 左營, Kaohsiung 高雄, and there’s probably several more scattered around Taiwan, but this one is apparently the largest of its kind. Such claims are often difficult to verify as pretty much any temple with a big statue is likely to say the same thing. 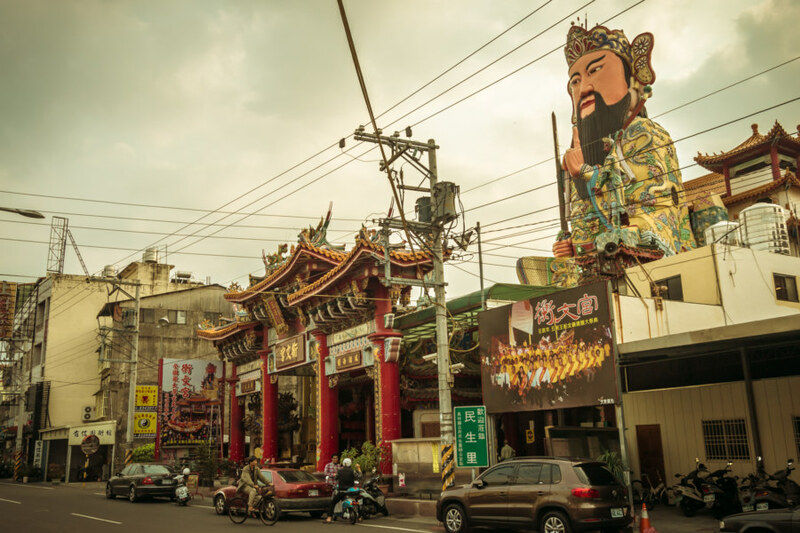 Xuanwu looms over the streets of Yuanlin in serene repose. 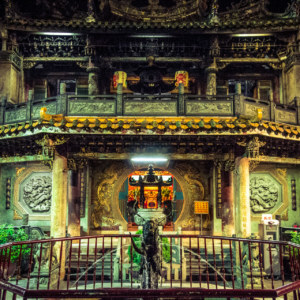 The wide entrance to Hengwen Temple. A closer look near the door on the right side. 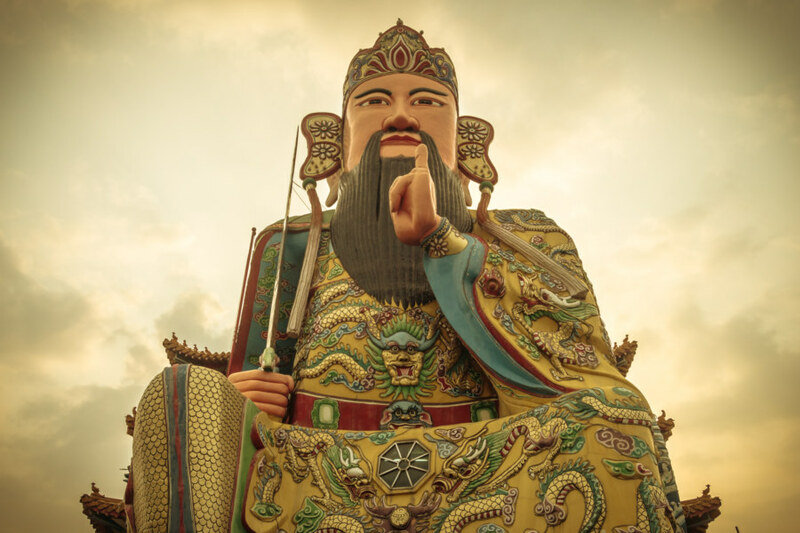 The legend of Xuan Wu goes something like this: he was born a mortal, either a prince or a butcher, but rejected his calling to devoutly study Taoism. While on the pathway to enlightenment he is told, presumably by the gods, to cleanse himself of worldly sin and impurity—in one telling, for having eaten meat, and in the other for killing animals without remorse. In a moving demonstration of piety he slices himself open and washes his own organs in a river, staining it black in the process. His intestines transform into a monstrous snake and his stomach turns into a demonic turtle. Both creatures escape to terrorize the local populace—but having achieved immortality, Xuan Wu charges into battle and vanquishes them both. 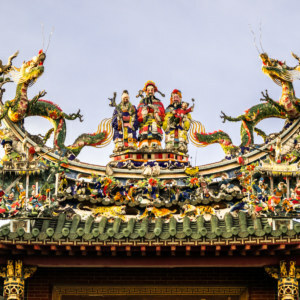 Subdued, the turtle and snake then become his willing allies, a story not unlike what happens with the goddess Mazu 媽祖 and her two demonic companions, With-the-Wind Ear 順風耳 and Thousand-Mile Eye 千里眼. 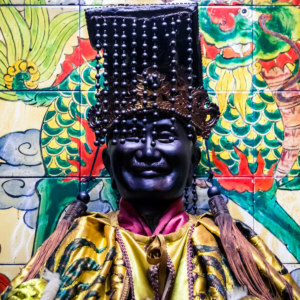 A statue of Xuan Wu, the Black Tortoise. 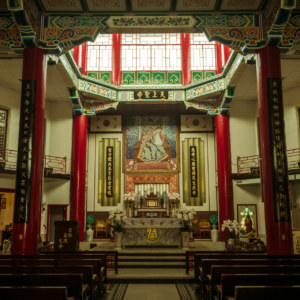 Overlooking the main altar at Hengwen Temple. 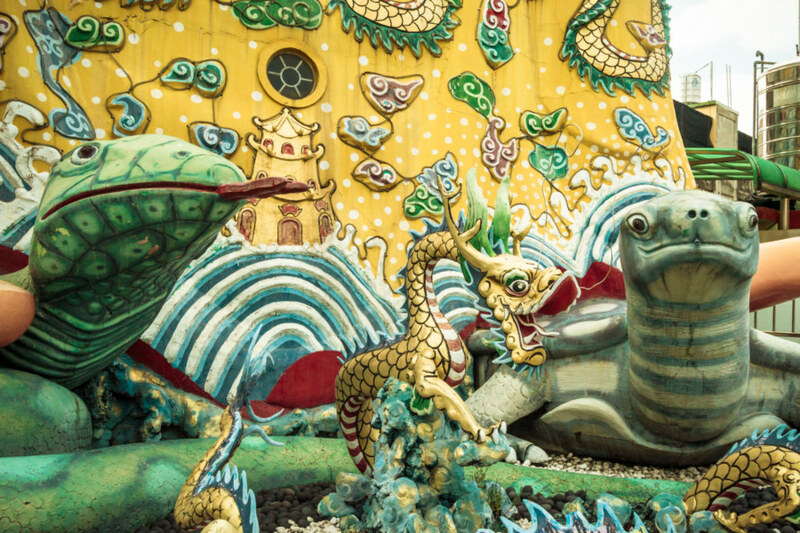 The ground floor of Hengwen Temple features an iconic depiction of a snake wrapped around a turtle also known as Xuan Wu—exactly the same name as the deity himself, confusingly enough—although some sources refer to it as the Guīshé 龜蛇 (“Turtle Snake”), Xuánguī 玄龜 (“Dark Turtle”), or Wūguī 烏龜 (“Black Turtle”). In English it is generally known as the Black Tortoise and it is one of the Four Symbols 四象, a set of mythological beasts representing the seasons in traditional Chinese astronomy. Xuan Wu (the mythical turtle and snake) represents the northerly cardinal direction and the season of winter—which should explain another variation on the name of Xuan Wu (the deity), which is sometimes prefixed with Běijí 北極, “North Pole”). A lengthy placard in front of the statue explains that you can circle it three times and touch various parts of the entwined animals for what I would assume is good fortune. On the second level of Hengwen temple, Yuanlin. 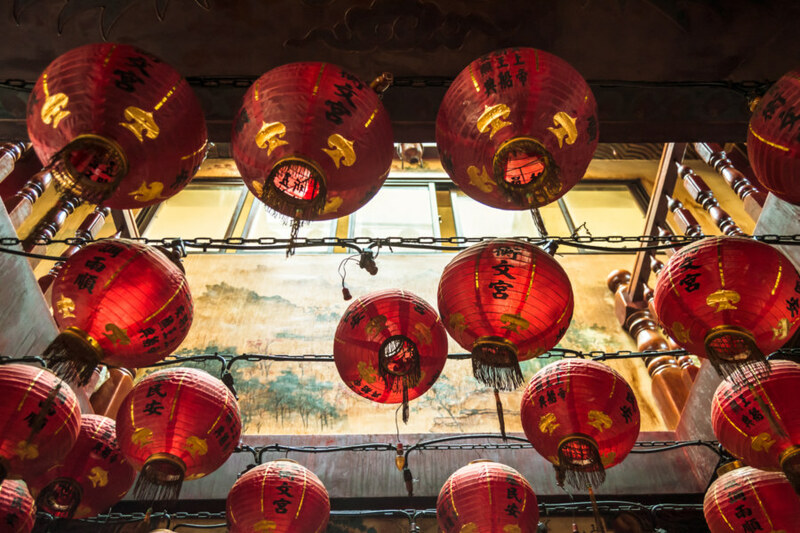 A jumble of lanterns on the second floor. 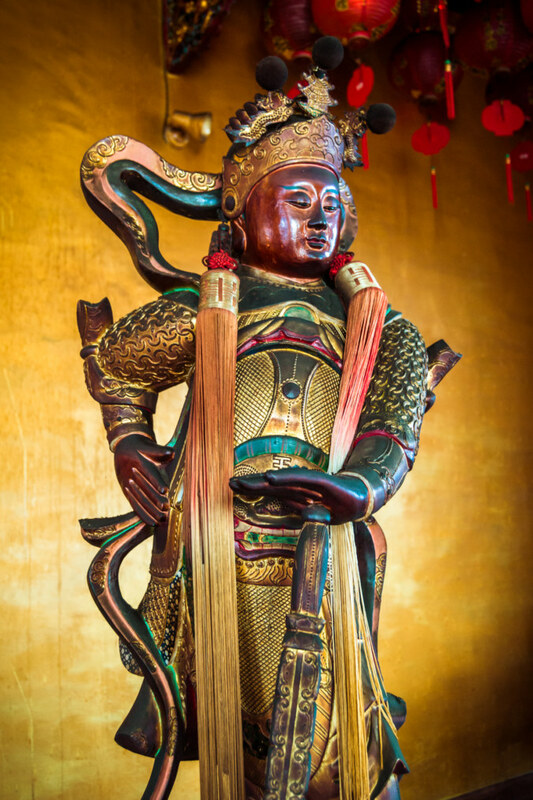 Weituo, a bodhisattva that commonly guards altars. 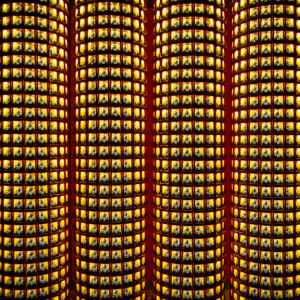 Several of the 18 Arhats off to one side. The topmost chamber in the main temple is mostly Buddhist in nature. 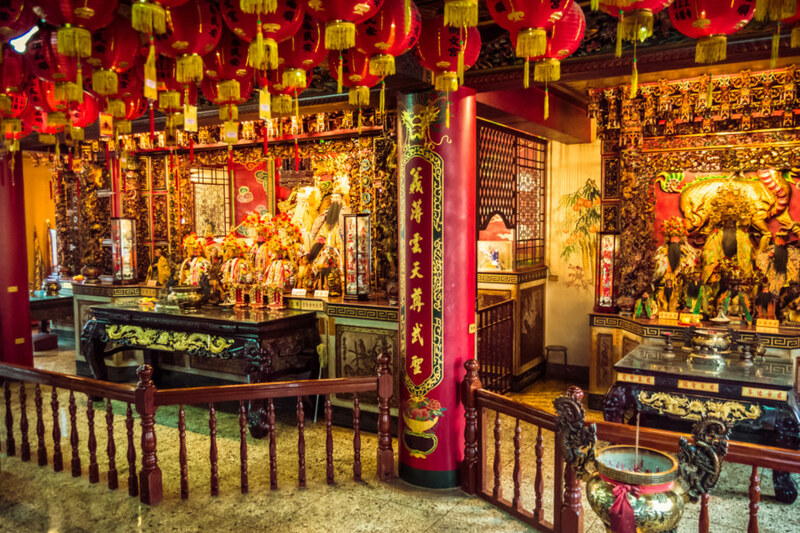 This may seem strange given that it is a temple devoted to a Taoist deity but Chinese folk religion in Taiwan blurs various faiths into a folksy, syncretic blend of influences. 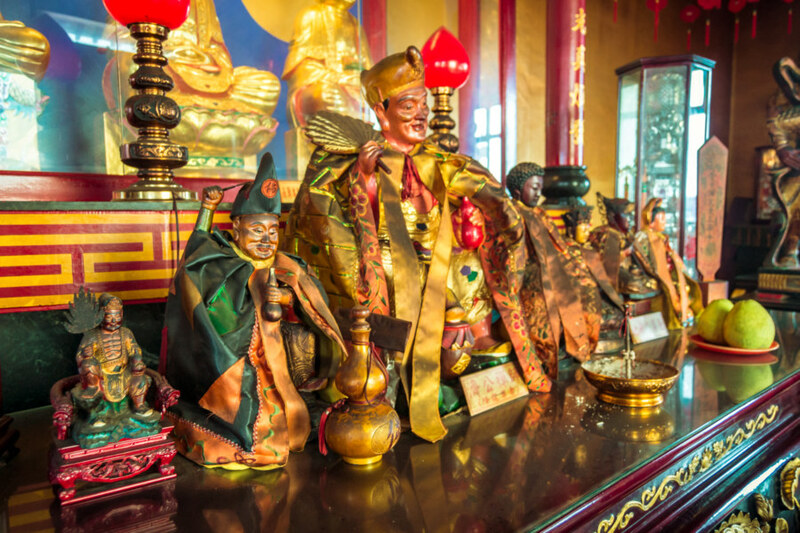 It’s a safe bet that nobody patronizing this temple thinks twice about the differing origins of the various statues and symbols adorning each altar. 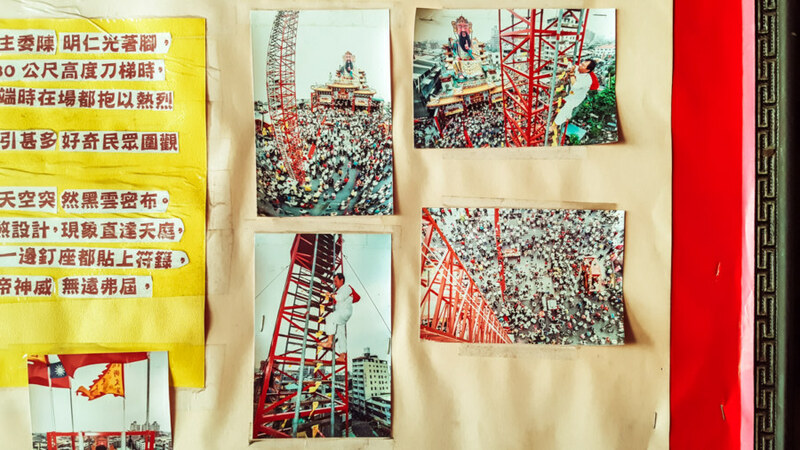 Here I captured photos of Jì Gōng 濟公, the drunken monk; Wéi Tuó 韋馱, a Mahayana bodhisattva generally referred to as Skanda in English; and several of the 18 Arhats 十八羅漢 off to one side. On the left, Marshal Zhao 趙元帥. On the right, Marshal Kang 康元帥. The Dark Warrior, 72 feet tall. Snake and turtle underfoot. The entrance to the god’s body is on either side. 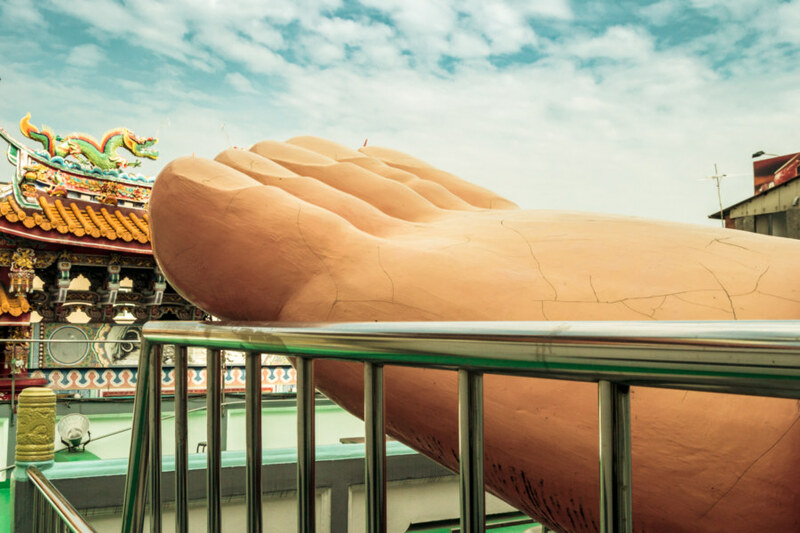 Giant toes for a giant god! 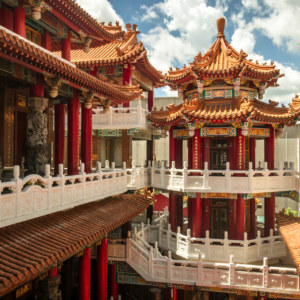 After returning to the second level one can walk out onto a balcony surrounding the enormous statue of Xuan Wu. 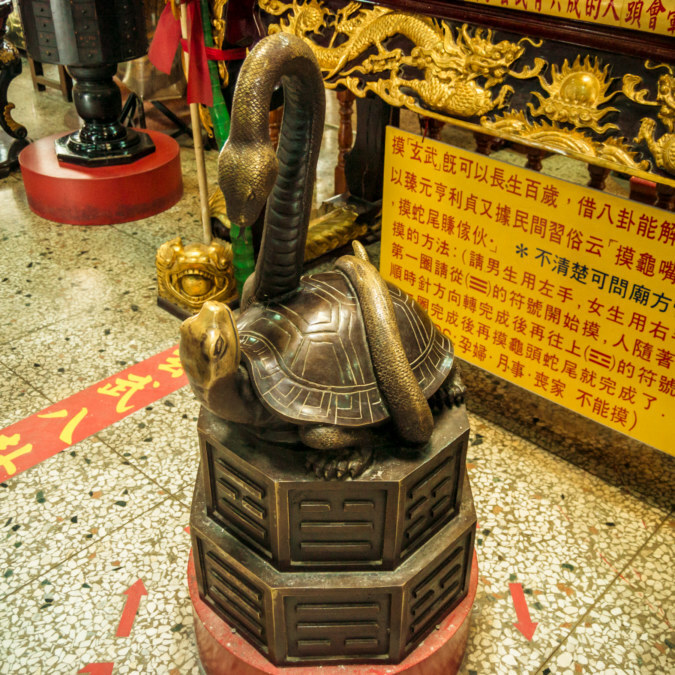 Here one will find quirky representations of the snake and tortoise (but no grisly coil of intestines like you’ll see at Lotus Pond). Xuanwu is flanked by generals identified here as Marshal Kāng 康元帥 (with the red face on the right) and Marshal Zhào 趙元帥 (in black on the left), two of several gods responsible for the enforcement of divine law. A depiction of Qilin on the second level of the god’s body. A more sedate appearance on the third level. The fourth was too cramped for a decent photo. 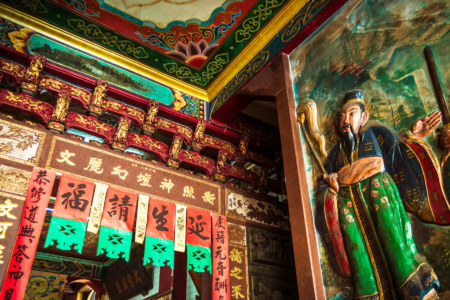 The body of the god is cramped and musty but not without a certain vintage charm—the interior design definitely shows its 1960s roots here! 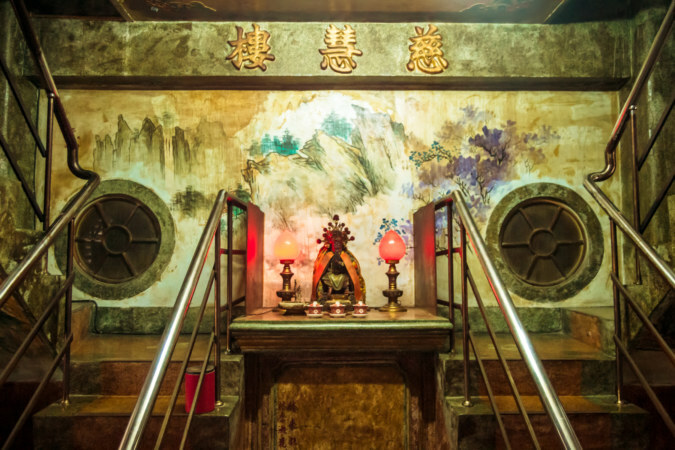 Four levels are open to the public, each containing a small shrine, a large extruded inscription, and murals depicting stories from the life of Xuan Wu (or perhaps Taoist tales in general; I’m not nearly enough of an expert to say one way or another). The inscriptions on the second to fourth level are Hàorántīng 浩然廳, Cíhuìlóu 慈惠樓, and Chǎndàoyuàn 闡道院. Beyond the fourth level is a locked metal gate with a moulded frame bearing several inscriptions: Zhōngzhèng Gate 中正門 (the main entrance, I suppose) as well as several other passages that I couldn’t make out, “awe-inspiring”, “righteous”, and “ancient” among them. Hmm, a locked gate leading to what we might presume is the mind of this enormous god? Consider my curiosity extremely piqued. Preparing for an everyday exorcism. 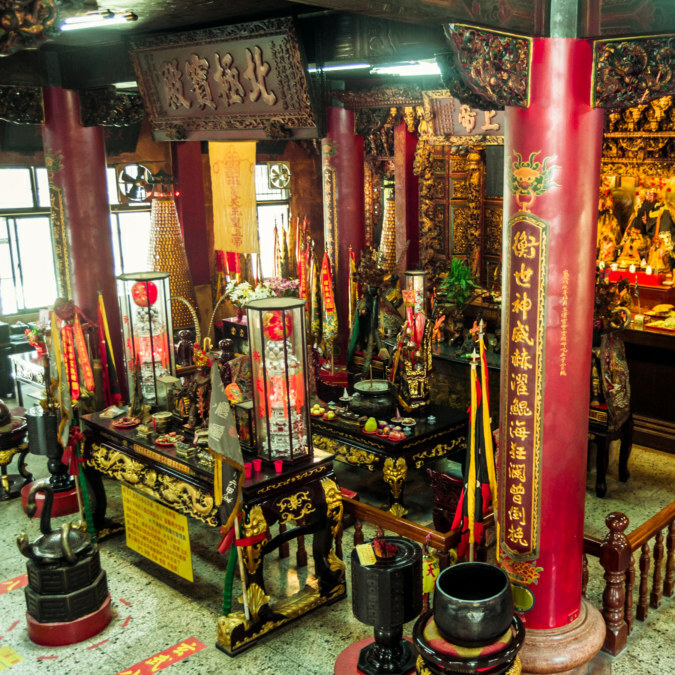 Another aspect of Taiwanese temple culture I observed at Hengwen Temple is a folk custom known as Shōu Jīng 收驚, literally “removing fright”. If you are ever spooked—by something like a loud noise, a close call on a scooter, or something else that induces a sense of shock—it is believed that your soul (or one of them, anyway) can flee, leaving you feeling anxious and uneasy. Anyone suffering these symptoms can visit this temple to have a brief ritual conducted to dissipate fear and encourage the soul to return. It is essentially a kind of exorcism but it involves nothing more extreme than saying prayers and waving sticks of incense over clothing left behind by the supplicant. 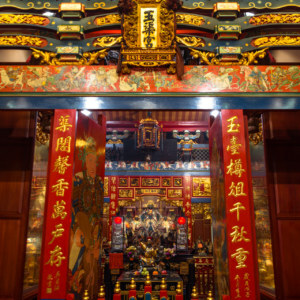 I have seen this ritual performed at the famous Xíngtiān Temple 行天宮 in Taipei 台北 where long queues form for temple staff in blue robes. 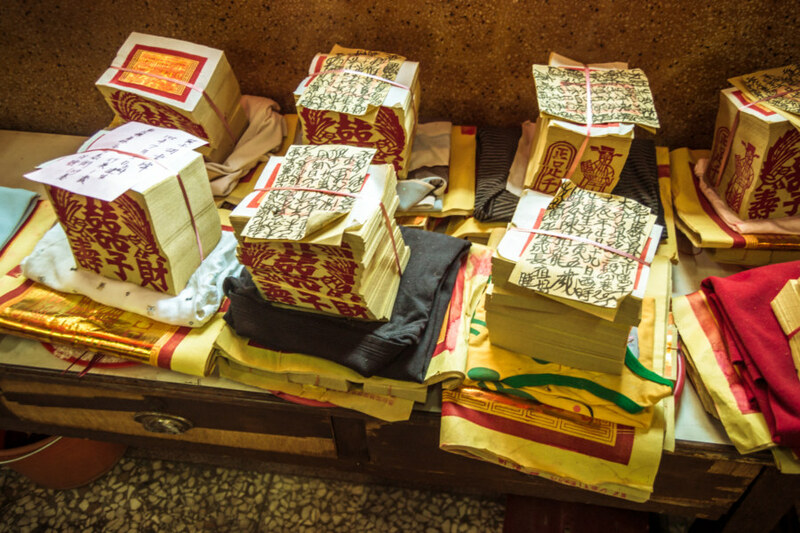 Apparently they also offer the sort of service you can see here at Hengwen Temple—a kind of dry cleaning for your soul where you drop off a change of clothing and return to pick up your newly sanctified garment after the ritual has been conducted. Honestly I don’t know too much about how this ritual works so I can’t comment on the pan of rice—but I would imagine the stack of joss paper will be consumed by fire to pay for supernatural services rendered. A billboard with postings from previous temple events. On my way out of the temple I noticed a billboard with many photos posted from past events. Taking a closer look, one of these events revolves around knife ladder climbing, which is pretty much what it sounds like. Challengers scale a tower with a ladder made of 108 knives after performing various rituals of protection and fortification, hopefully without mishap. I wonder if the winners gain access to the locked room inside the body of Xuanwu? 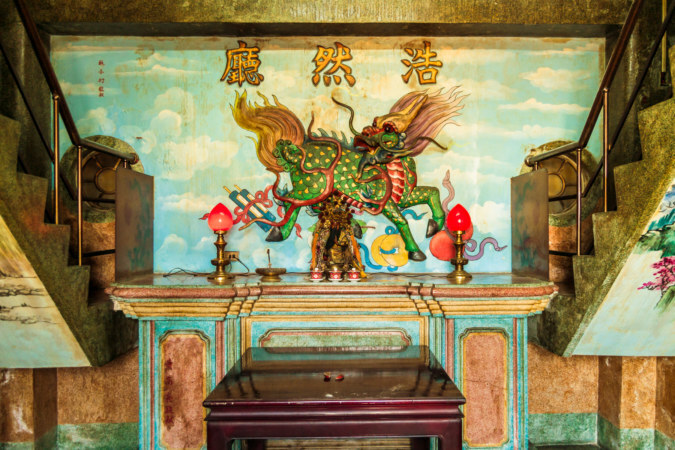 Curiously, Hengwen Temple also practices a boat-burning ritual known as Shāo Wángchuán 燒王船 despite being nowhere near the sea. 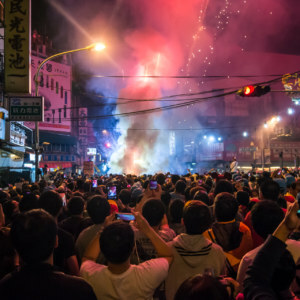 This ritual is more famously associated with Dōnggǎng 東港 in the far south of Pingtung 屏東. This festival involving a tall tower caught my eye. Turns out its a ladder made of knives these people are climbing! 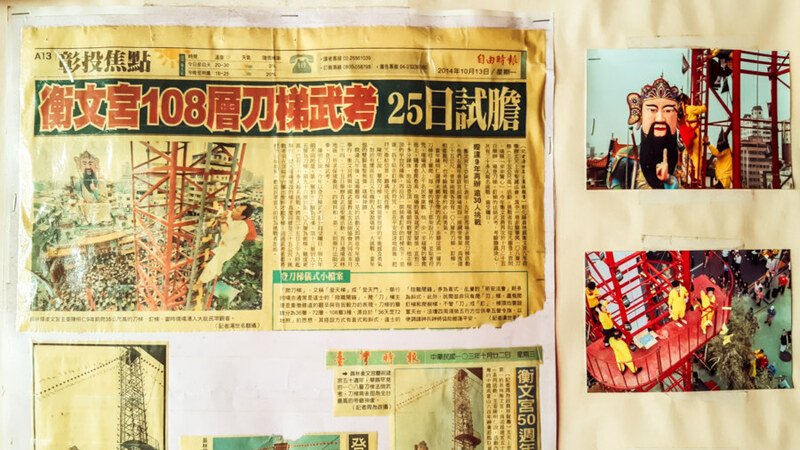 Finally, a bit of backstory about this post: I chanced upon Hengwen Temple while riding around Yuánlín 員林 one day in spring 2014. Previously I had no idea this place existed so you can imagine my genuine surprise when I rounded a corner and saw a gigantic statue looming overhead! 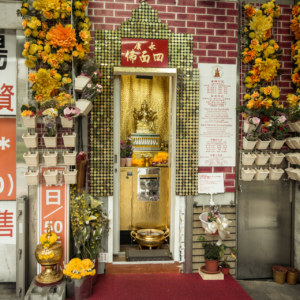 I blogged about it shortly thereafter in one of my first posts about temples in Taiwan but my understanding was so basic that I failed to even identify the main deity with any accuracy, much less recount his origin story or any interesting details about the temple. 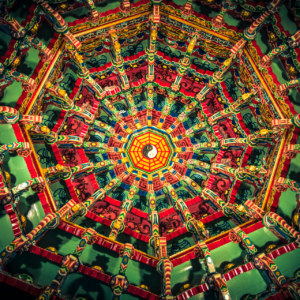 I returned more recently in the fall of 2016 and decided to take the opportunity to greatly expand this post to better reflect my growing knowledge of temple culture in Taiwan (and to share a few more recent photos that I consciously post-processed in a more maximalist style similar to how I was doing things years ago). 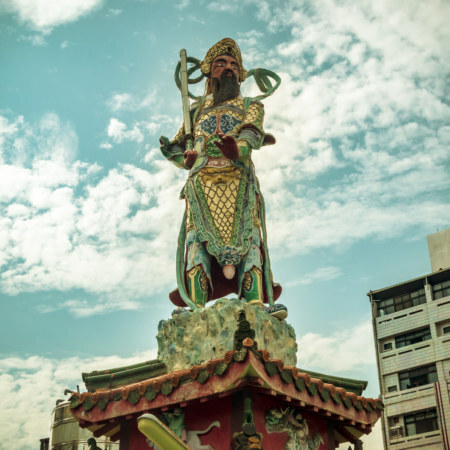 I’m still no expert in these matters and may have made some glaring mistakes—but given the dearth of decent English language resources about Taiwan folk religion on the web I figure it’s better to get something out there and update as needed. Feel free to leave a comment with corrections if you notice something that sounds wrong!